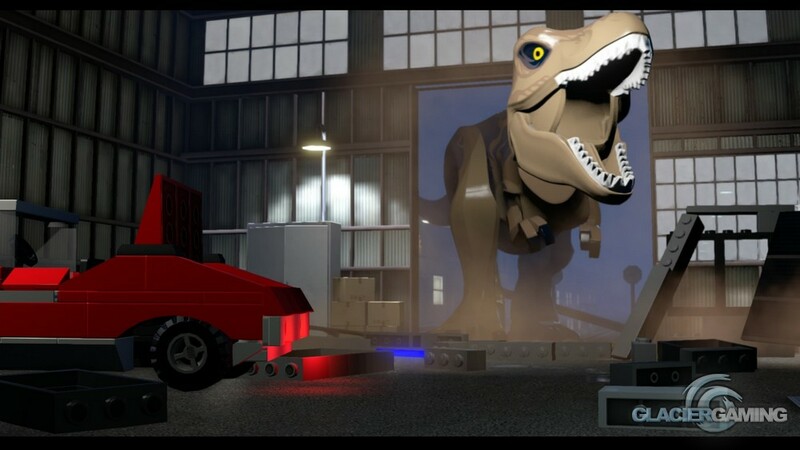 LEGO Jurassic World is the newest entry into the LEGO video game franchise. Covering the first three Jurassic Park movies as well as this summers block buster hit, Jurassic World. Can the video game live up to the prehistoric legends? 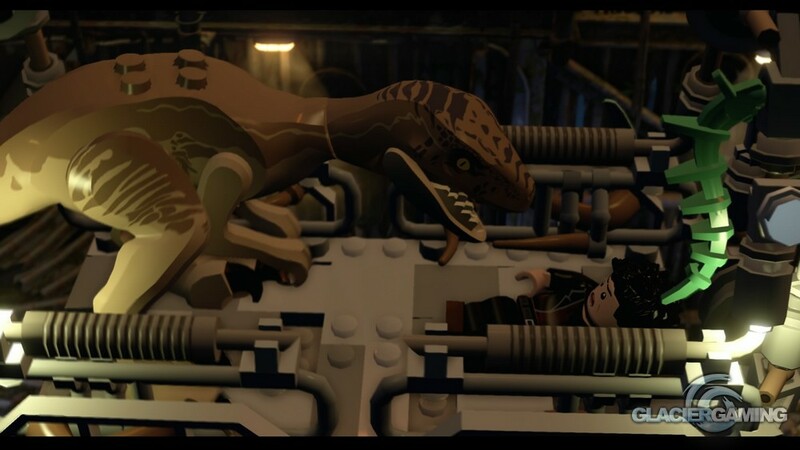 When I first loaded up LEGO Jurassic World, I first noticed the music. That iconic theme song that accompanied Spielberg’s masterpiece all those years ago has still got it. It still sends shivers down my spine, and really there is no other musical arrangement that would be appropriate. To change it would be a crime greater than The Original Sin, so I’m glad that TT Games elected to include it. Not only does it play on the nostalgia of the older generation, it also helps tie the game into the movie franchise. 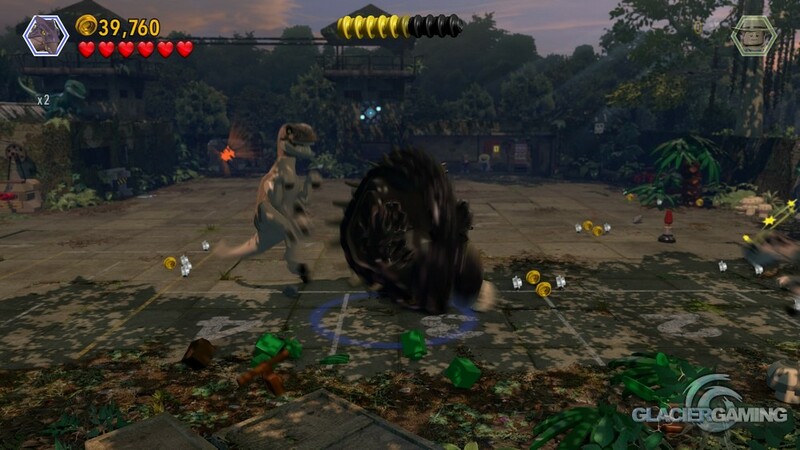 LEGO Jurassic World gives you the choice to play in any order that you wish, but let’s face it unless you’ve played it before you’d want to play each segment in the order of the films that it’s based on. So I started with the classic: Jurassic Park. Each segment follows the storyline very closely, and apart from the main chunk of the levels it rarely deviates from the source material. Each segment last roughly about two hours, depending on how thorough you are, and I often found myself looking for the key moments from each film to see how well it translated to LEGO. 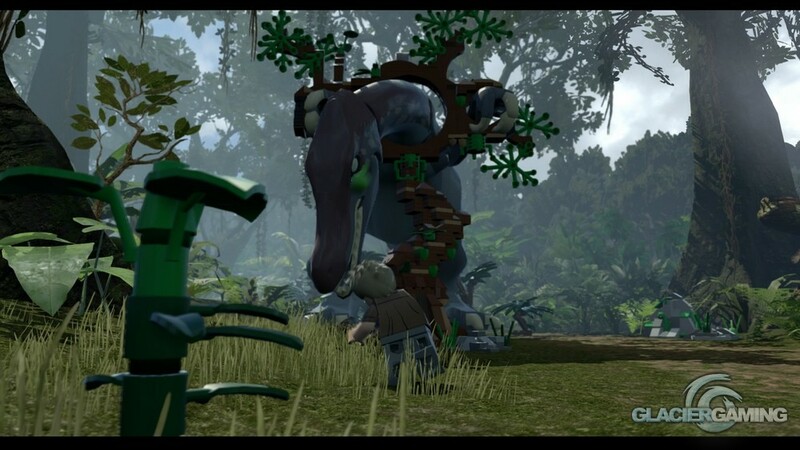 The LEGO series of games have never taken themselves seriously, and rightly so as they’re mainly aimed at the younger generations. The more gruesome scenes have been altered slightly to allow for the PG rating, but TT Games have done it in a way that still fits with the style of the game and often adds a little bit of humour to another wise serious moment. The T-Rex eating a whole chicken gets me every time. Seriously, a whole cooked chicken. It’s great! Though, I’ve yet to work out why LEGO characters like sausages so much. 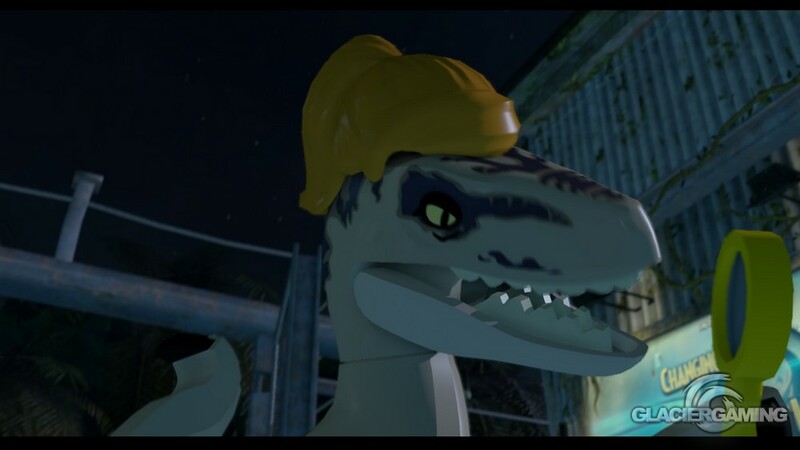 LEGO Jurassic World boasts about 120 different playable characters ranging from all of the main characters in the films to the slightly more obscure – remember the kid that answers the phone in Jurassic Park 3? He’s a playable character – and TT Games have made sure they use them to get the most out of the gameplay. 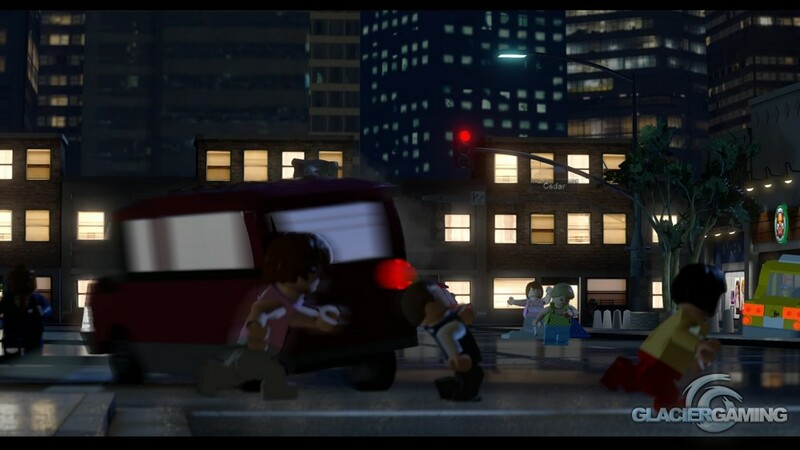 Throughout the main game, you’ll play as the main characters from the films, switching between each character as needed. 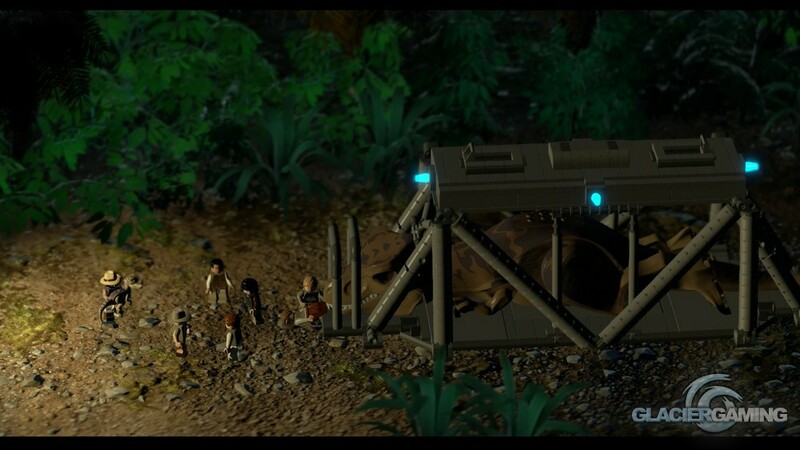 Along the way, you’ll also encounter more minor characters which you can purchase with some of your LEGO studs. These characters will be added to your full roster, where in free play you can use them and their skills to open up more of the levels. Each character is assigned a skill. 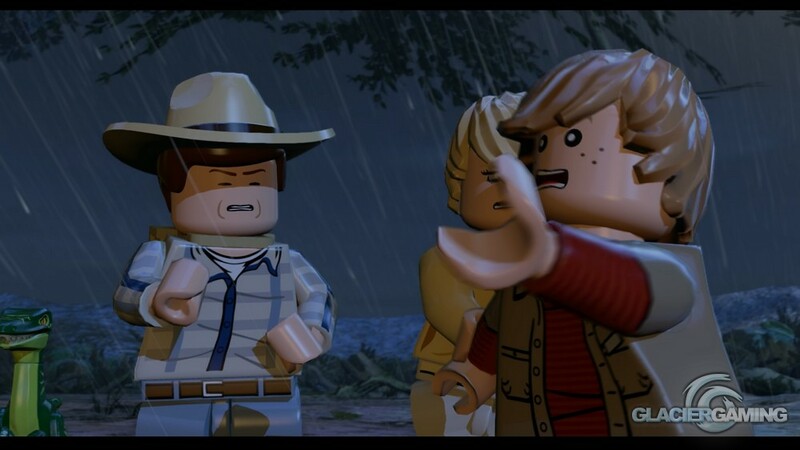 For example, Allan Grant has the ability to find hidden items under the ground and using his velociraptor claw he can cut through vines. 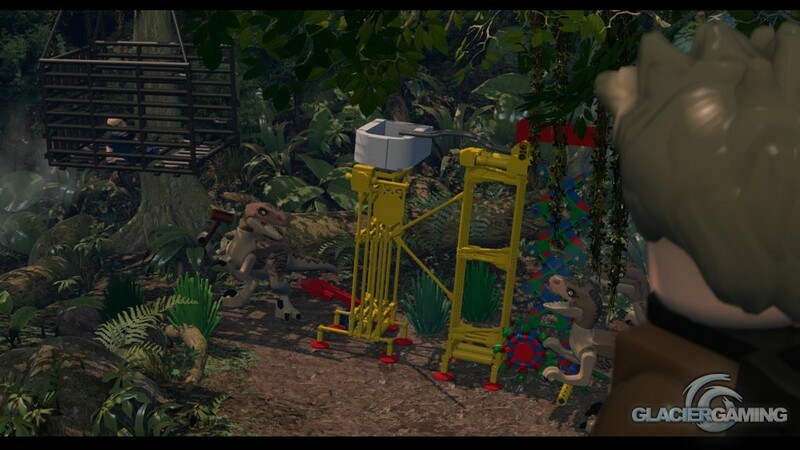 Ellie Sattler can use her dino know-how to find objects of interest in piles of dino-dung and the younger characters can fit through small places to reach otherwise inaccessible areas. 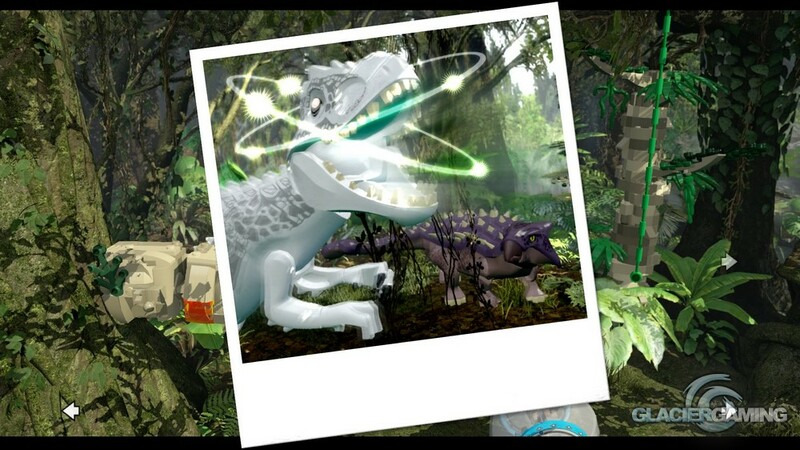 Some even have cameras which can be used to stun dinosaurs in your path, each time yielding a comical Polaroid for your troubles. 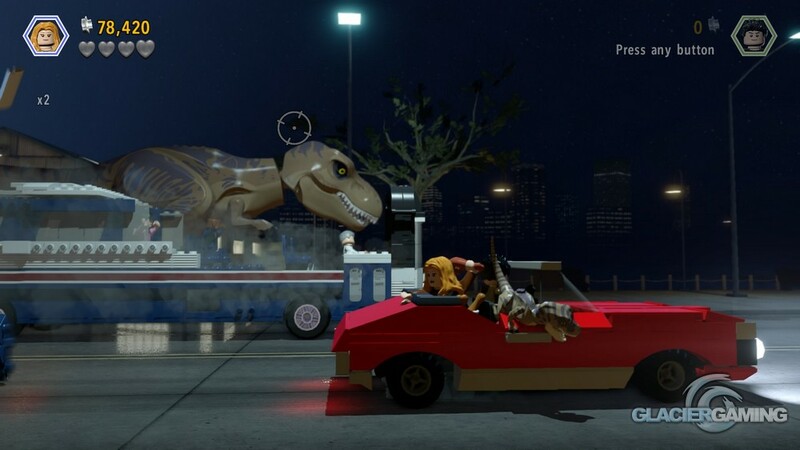 In addition to the human characters, for the first time in the series, players also get to play as dinosaurs. This really is as fun as it sounds. 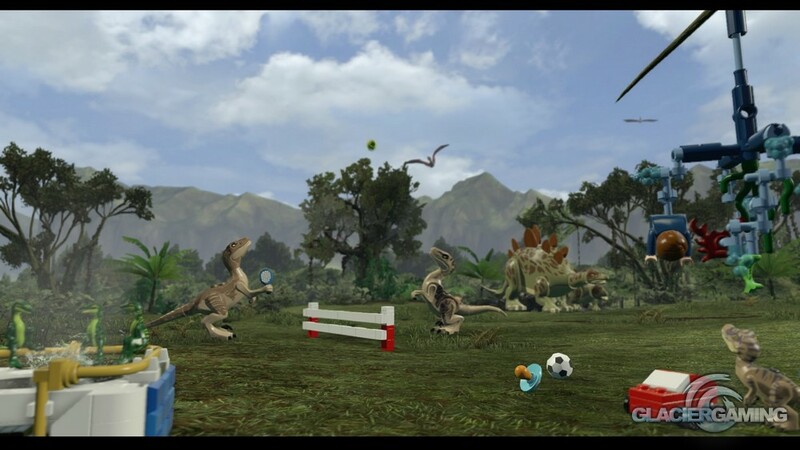 Throughout each level are specific points with which only the dinosaurs can interact with. This might be some thing as simple as a fallen log for the mighty Triceratops to destroy, to the glowing orange rocks which are only susceptible to the magnificent roar of the T-Rex. 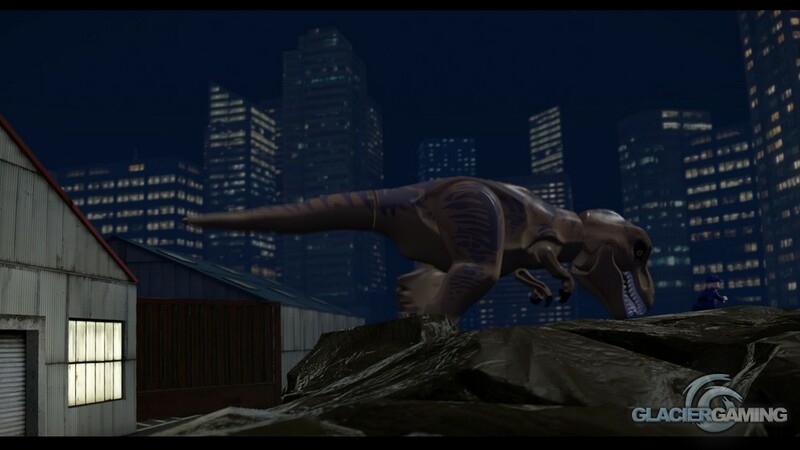 As well as the collection of film inspired levels, the game also offers you the opportunity to play god and create your very own dinosaur. By manipulating the DNA code players are able to change the colour and patterns of any and all of the terrifying lizards to make the gameplay a little more personal. Collecting pieces of amber throughout the main game adds more options to your arsenal, eventually unlocking more and more to play with. You are also able to create your own LEGO character for use in free play, giving him or her one of the pre-set character types which allow your character to interact with different sections in the free play mode. 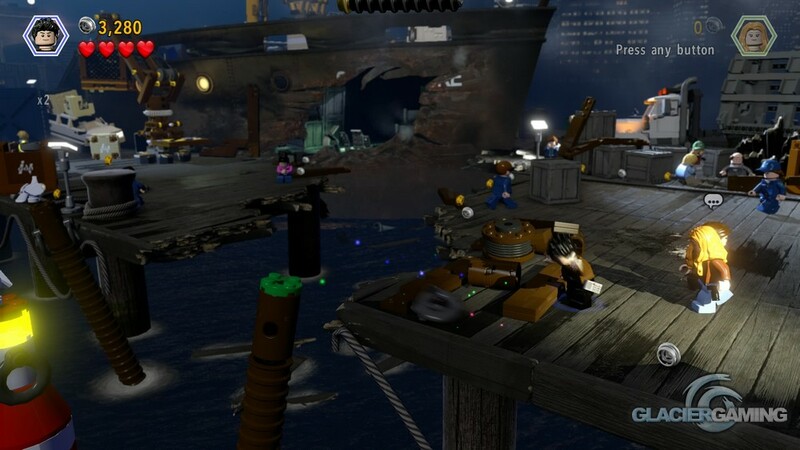 Graphically speaking, although a large portion of the game is focused on LEGO, a lot of the backdrops look pretty good. 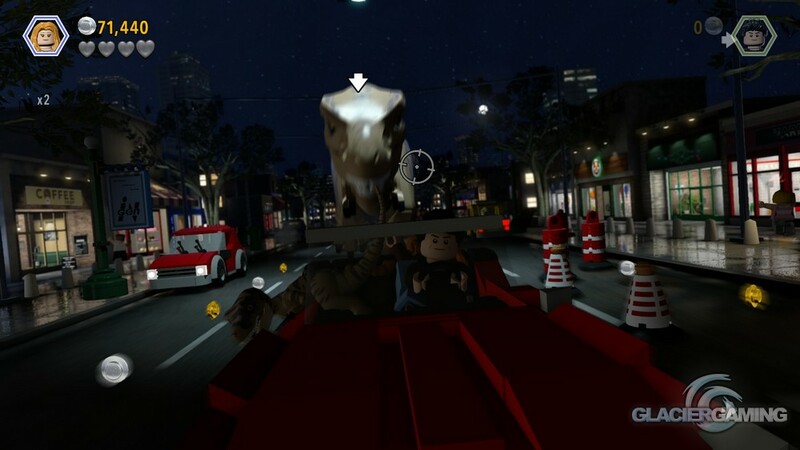 It’s clear that TT Games have taken their time in transferring the Jurassic Park series into video game form and they have been very true to the source material. So much so that even the voices seem to be taken directly from the films themselves. This disappointed me a little bit. 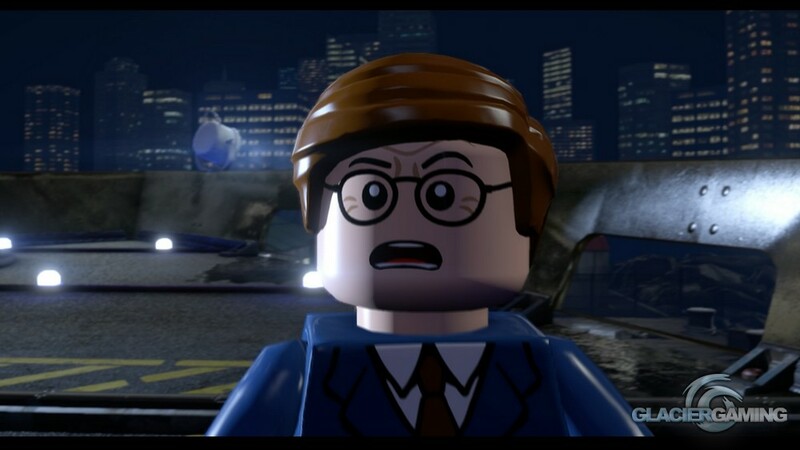 Although TT Games have tried to clean up the audio, it just doesn’t fit with the LEGO representations on screen. Especially some of the dialogue from the earlier films as the quality isn’t as good as modern day movies. In some scenes, I’m sure I can hear ambient background music and noises. While playing the game’s main campaigns, I found each section lasted roughly the same time as the film it was representing. So pretty much 2 hours per film. This gives the overall game a rough play time of about 8 hours. That’s pretty good for a game in this day and age. Add this to all of the additional content and you’ve got a jam-packed adventure with Dinosaurs and LEGO, what more could you want? One of my main concerns, however, was that a lot of the gameplay can get a bit samey. This may be because I’m a bit of a completionist and strive to get the “True Survivor” award on each level, which is obtained from breaking enough of the scenery and other items to collect a pre-set amount of LEGO studs. Some of the puzzles did have me stumped for a while before I realised I should just be destroying everything that’s made of LEGO. 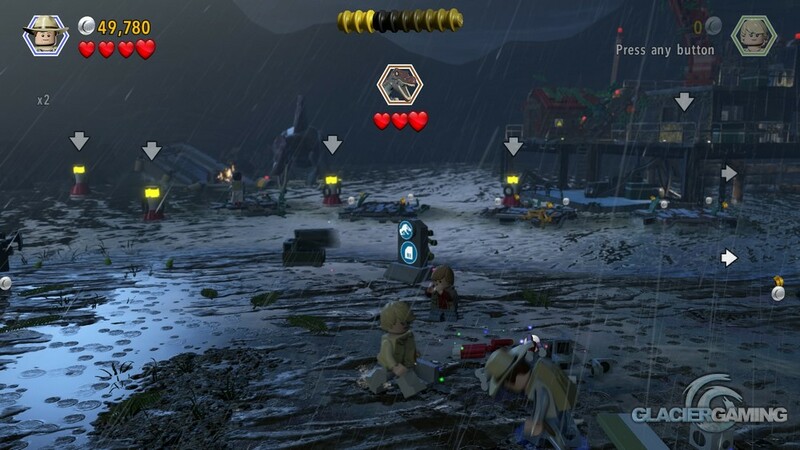 Co-op makes a return, which seems to be a staple of the LEGO franchise, I only wish they would do something about the dynamic split screen. Not only is it massively confusing, I found that after a few minutes it just got on my nerves. I might be missing an option to change this in the settings, but if that’s the case why is this not enabled by default? However, with this problem aside the multiplayer is fun, as always. 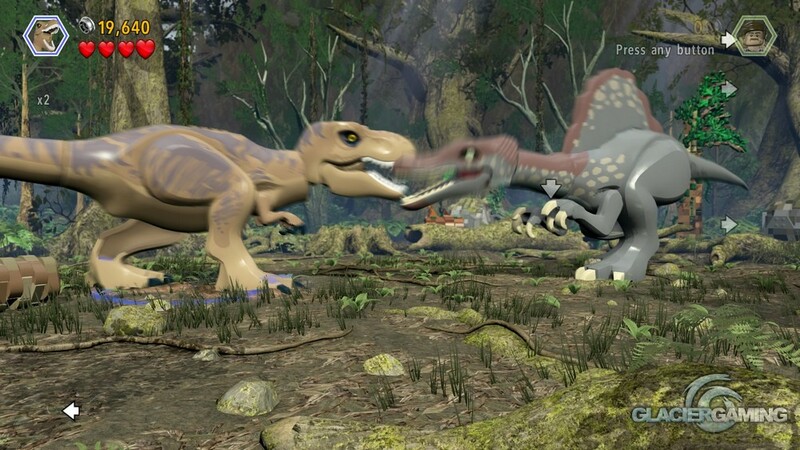 Though when both parties are playing as dinosaurs it’s natural to try fight to the death! 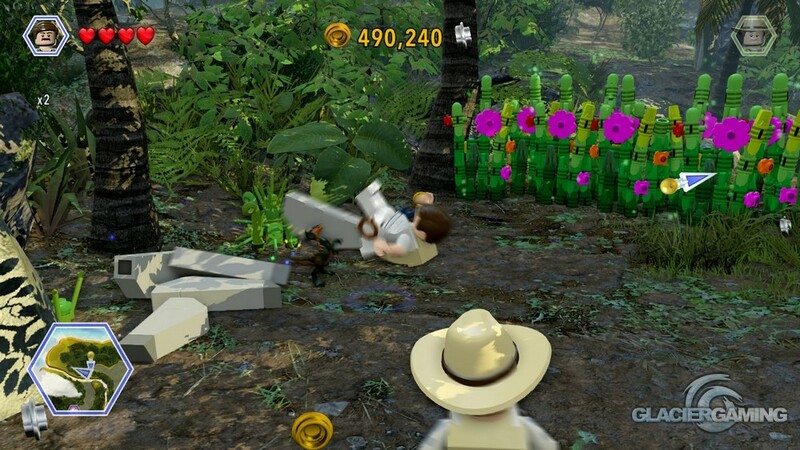 Overall, LEGO Jurassic World is a game that you can just play. You don’t really need to worry too much and its relaxed pace is a nice change from a lot of games that are out at the moment. Its humorous take on an iconic series is far from slapstick but isn’t afraid to give us a few laughs at its own expense. 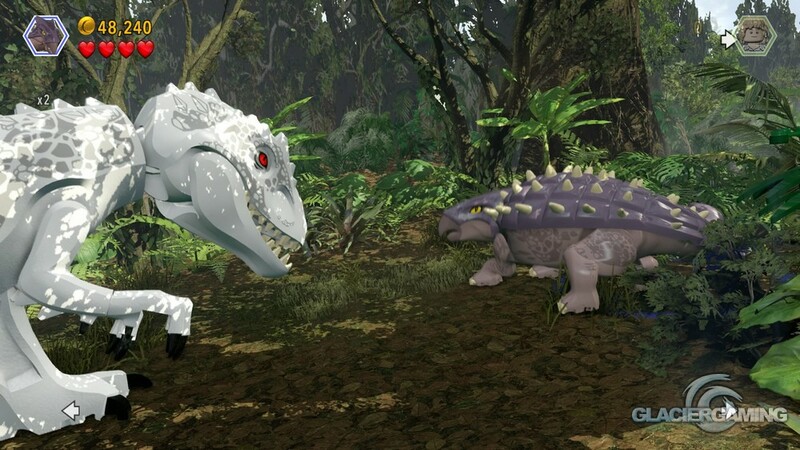 If you’re a fan of the LEGO series of games, then LEGO Jurassic World is worth adding to your collection. A great return to an epic franchise which can be fun for the whole family. And if any one knows what the whole sausage thing is about, please enlighten me. 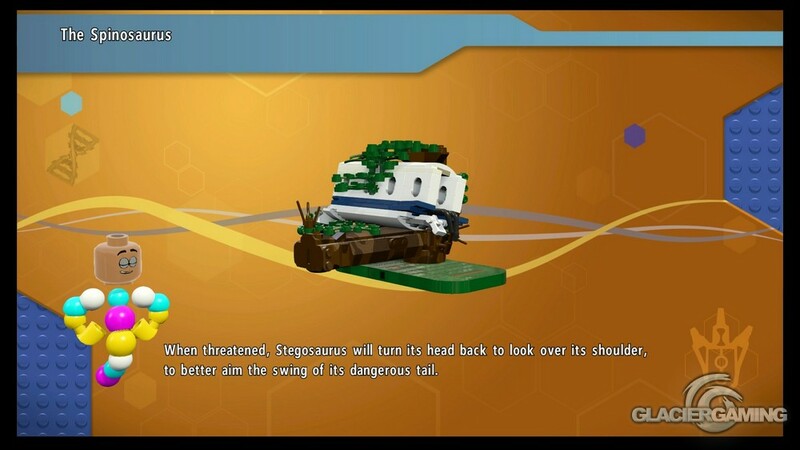 This review is based on playing the PlayStation 4 version of LEGO Jurassic World that was kindly provided for review purposes by Warner Bros. Interactive Entertainment.